Born in 1964, Holmes is a bit of a paradox - a mix of East Coast tradition and West Coast contrariness. Born and raised in Pittsburgh, she attended Smith College and graduated from Brown University, majoring in Fine Art. She then studied at University College London's Slade School of Fine Art, living several years in London. Most recently, she and her family moved from the Venice area of Los Angeles (where she lived for more than ten years) to San Miguel de Allende, an artist colony in the mountains of central Mexico. 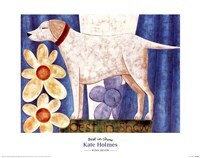 She opened Estudio Kate Holmes there in January 2002. She opened a gallery in May 2002 in Hyannis Port, Massachusetts where she and her family now reside. 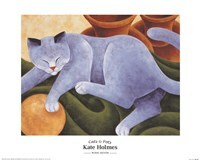 It is this timeless environment, where Holmes spent long summer days at her grandmother's house, which provides the fundamental source of Holmes' art. Her style combines natural settings, birds, animals, and of course, sailboats. Her objective is to focus on deceptively simple forms that personify her love of nature - illuminating their classic beauty in an evocative, poetic and peaceful yet compelling composition and palette. Her paintings strive to present in tangible form the beauty and imaginativeness of that which is "childlike". In many ways, her art reflects her reality. Along with being an artist, this wife and full-time mother works her painting time in and around the daily challenges that accompany her children: two boys, age 8 and 3, and a 2-year-old girl. Each day is a self-described "study in the magical, mystical experience of 'mommying'", an exercise in wonder, raw energy and yes, occasional mayhem. Holmes takes great care fashioning her reproductions. She employs a state-of-the-art system that creates limited editions using special pigmented inks. The results are spectacular: vibrant reproductions, individually produced by hand on museum quality paper.